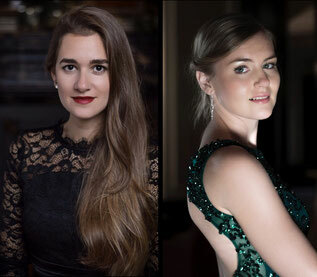 Isabel Pfefferkorn (mezzo soprano) and Hanna Bachmann (piano) will be performing 5 concerts in the US and Canada this May. The program includes Schuber's Winterreise, as well as the world premiere of Isabel Pfefferkorn's piece Wüstenschrei. Isabel and Hanna are looking forward to seeing you there! Contrasting classical collection. A clarinet and a piano, together like you've never heard before. Radutu's and Adenberger's unlimited love for music results in probably the most diverse album for clarinet and piano you've ever heard. Modern humor and dark deepness in Penderecki's Miniatures, America's jazz of the 20s and 30s in Gershwin's Rhapsody in Bue and Shaw's Clarinet Concerto, Spanish gypsy virtuosity, German elabora romance and French singing melancholy. You can find this CD on all common platforms, such as Spotify or Amazon. Cellist Martin Rummel has released his 50th album! Popper’s Cello Concertos are rarely heard in concert nowadays. The artists of this CD, Martin Rummel (Cello), Mari Kato (Piano), the Czech Chamber Orchestra Pardubice and conductor Tecwyn Evans recorded these four concertos in November 2017. 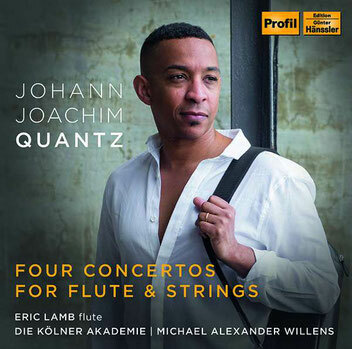 The CD was globally released on the Naxos label on 8 March 2019. Niall has joined Youtube-Sensation Allie Sherlock for a recording of a new Irish Christmas Carol by John Manners (on keys)!! We love it, when our artists go out and do new stuff and join up with new talent! Hope you enjoy this little Christmas-greeting from Niall too! 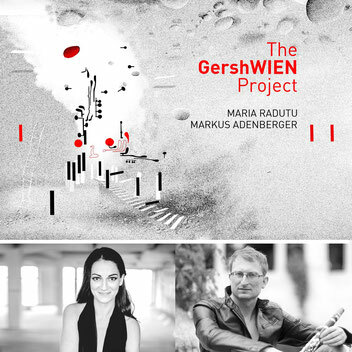 An amazing concert of the Duo Arcord on 26 November 2018 at the Gläserner Saal at the Musikverein Vienna! Congratulations to Ana Topalovic and Nikola Djoric! 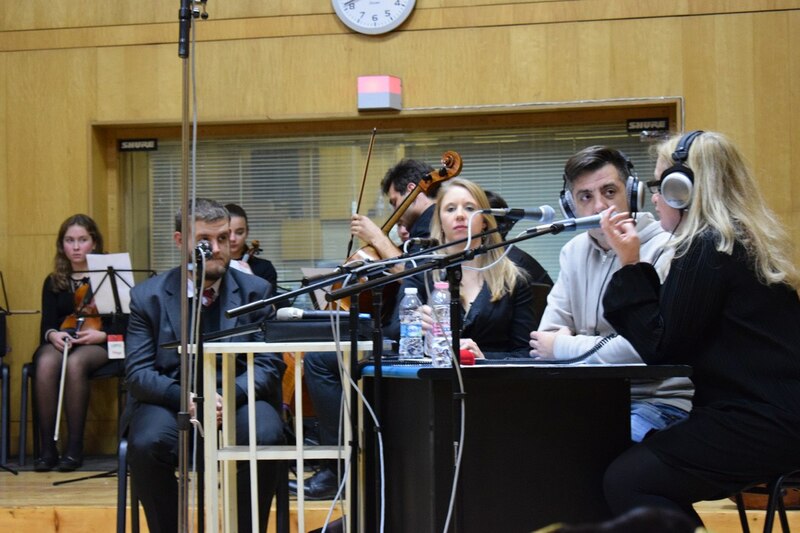 On 23 November 2018, polaris owner Susanne Grainer was invited by Radio Plovdiv - Радио Пловдив - for an hour-long interview to introduce our artists and their various projects and talk about the change in the classical music market over the past decades, the influence of the technical development on the classical music scene and the challenges musicians and managers are facing due to those changes in today's world. The interview was followed by questions from the audience as well as a discussion group with Susanne and the young musicians of the "Frank Martin Players - The Plovdiv Youth Orchestra" about first steps as a professional musician in today's world. 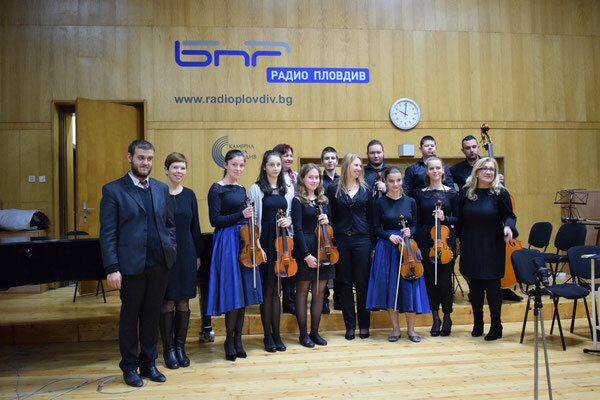 Thank you, Radio Plovdiv and Galina Vracheva for the invitation! 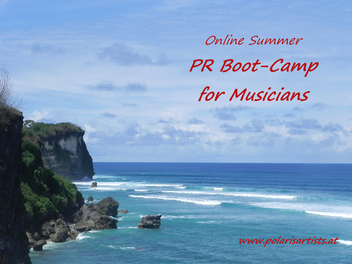 WE WILL GO WHERE MOST INTERNATIONAL MUSICIANS USUALLY DON'T GO TO - AND YOU CAN BE PART OF IT! It is one of our main goals at polaris artists to connect the peoples in this world better through music and with that create a better understanding of each others cultures and mentalities. 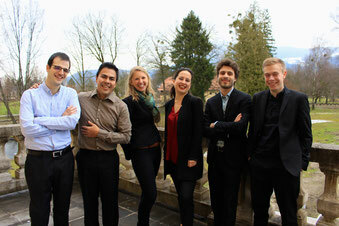 Together with the ensemble The Mirabell Project we have therefore started a longterm project in South America. Every year we will travel to a different South American country and visit regions/venues where international musicians usually don't go to (due to the lack of big concert venues, transportation possibilities, etc.). We will get in touch with the local communities through concerts (including concerts with local musicians), workshops, masterclasses, kids concerts and jam sessions with local musicians. Our first tour will take us to beautiful Colombia. In February 2019 we will travel to Bogotá, Medellín, and Bucaramanga (and possibly also Cali and Ibagué) for 3 weeks of musical activities with the people of Colombia. You can find out more about this project here. 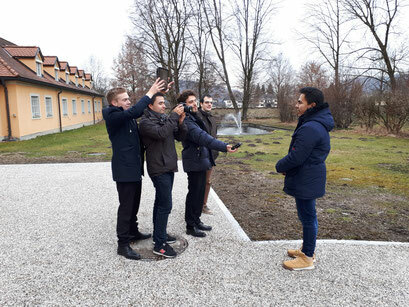 We therefore need your financial support to cover the travel costs from Austria to Colombia and back! We have some awesome goodies in store for you with which you will be part of this tour - check them out on the link below! Contact us if you have any questions to this project, we will be happy to answer them! THANK YOU FOR HELPING US TO REALIZE THIS PROJECT!!!! Every Wednesday during the upcoming weeks we will focus on one important element of a musician's PR strategy (on our Facebook page). We will talk about essential basic factors like CVs and photoshootings however also give you some advice e.g. on how to handle your social media accounts most effectively. We will talk about budgets for PR-work and also give you some tipps on what you can/should do with a low budget. Twice in the upcoming weeks we will also focus on YOUR personal questions! You can submit them either in the comment section below, via PM on Facebook or via e-mail to office(at)polarisartists.at. We will discuss the questions publicly, however we won't publish your name or contact details. 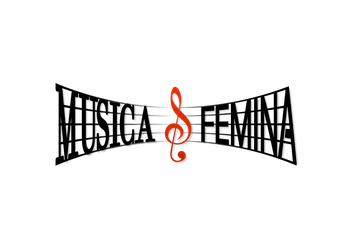 We are happy to give you a first overview of the planned performances, which will take place in the course of the exhibition "MusicaFemina" (July and Aguust 2018 at the Pflanzenorangerie at the Schönbrunn Castle). The concert calender will be updated regularly. You can find more information about the performances here. "Four of Johann Joachim Quantz’s more than two hundred concertos for the traverso show a broad spectrum of the composer’s creativity. Soloist Eric Lamb performs on a wooden flute, and his playing is warm and nuanced. He is well supported by the fluidly playing Kölner Akademie." Congratulations to Eric and the Kölner Akademie under Michael Alexander Willens for this great recording! The CD can be purchased here. You can read the full review (in German) here. 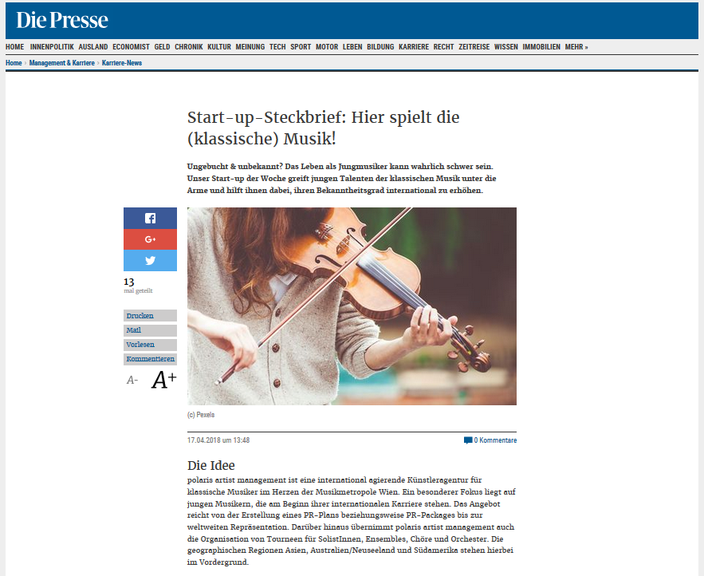 polaris artist management is "Start-Up of the week"
The Austrian newspaper "Die Presse" has released an article about our company as well as a short interview with owner Susanne Grainer about the challenges of founding an artist agency. You can read the full article here (in German). Maria Radutu presents her new program "Piano Box"
One piano, some memories and many emotions. Up close live concert with dedicated video show. In a plain, personal, emotional fashion. With pieces by Villa-Lobos, Gershwin, Poulenc, Gluck, Skrjabin, Pärt, Say and more. At icy temperatures just above 0°C and a few centimetres of snow in the valley we met with the five musicians of "The Mirabell Project", Alfia Bakieva, Juan Manuel Araque-Rueda, Jonathan Ponet, Giulio Padoin and Carlos Goikoetxea, at the Schloss Frohnburg in Salzburg to do Audio- and Videorecordings for their upcoming tour. We filmed not only in the beautiful concert hall of the castle but also in the gardens. Covered in warm jackets, scarfs and boots the five musicans gave their future South American audience a first glimpse into their adopted home Austria. In February 2019 "The Mirabell Project" will travel to Colombia to give concerts, workshops and masterclasses. 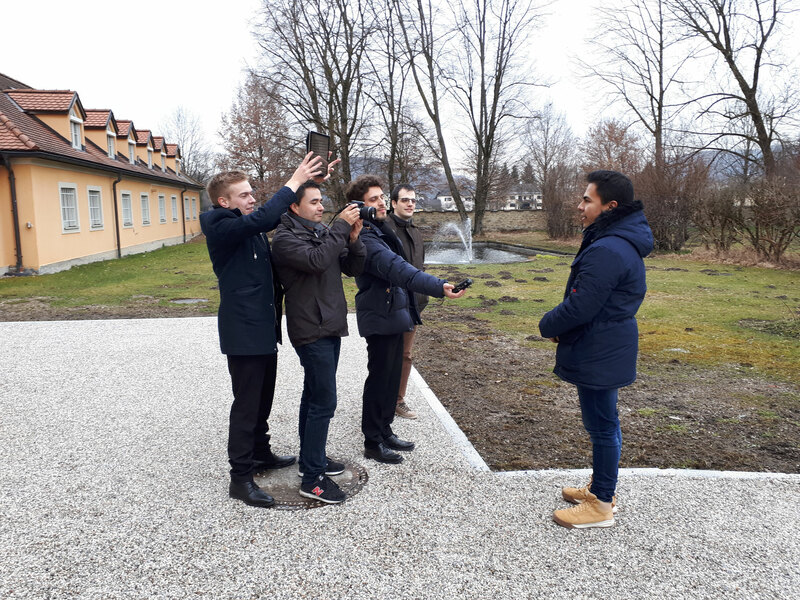 However not only the big cities are on the ensembles agenda, especially the more rural areas are a focus of this tour. The idea is to get in touch with the musicians and music enthusiasts of the not so well connected regions in Colombia to work, talk and of course also make music together. 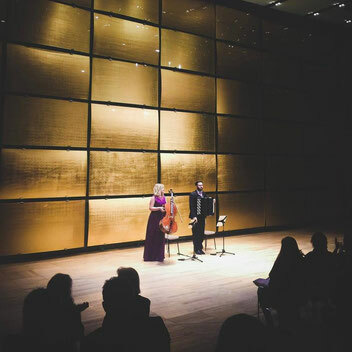 Find out more about "The Mirabell Project" and their upcoming tour. Finally, our PR-Packages for musicians are available! 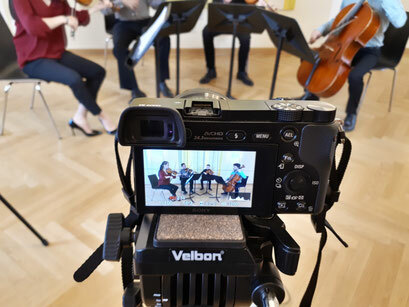 We organize your photo- & videoshootings, concert recordings, revision of CVs, Social-Media Coachings and much more so you can focus on the music and still receive all necessary materials in order to push your artistic career. No representation from our agency necessary! 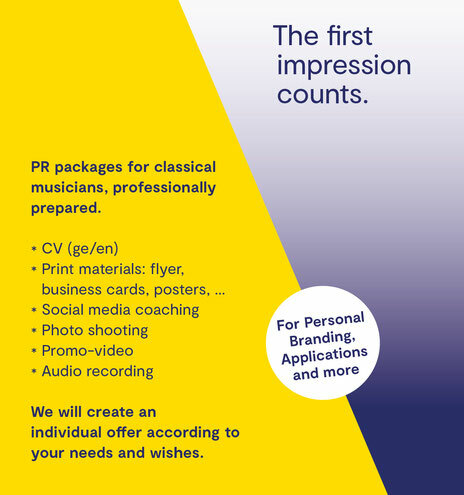 The offer is designed for ALL classical musician: soloists as well as ensembles! Free and non-binding first meeting, in which we will discuss the necessary materials! Cooperations with different photographers, graphic designers, etc. to find your perfect match!